Goal-setting pocket chart features a pull-through strip and clear pockets on the side to help you keep track of class or school goals. Nylon material is durable for long-lasting use. 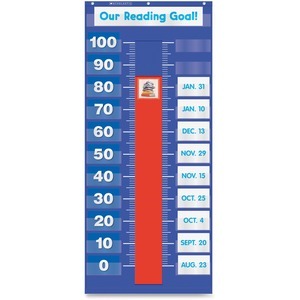 Insert pictures or accent cutouts in the strip's center pocket to identify your current goal whether a number of books read or number of cookies sold. Teaching guide allows you to create a more comprehensive experience. Pocket chart is designed for kindergarten through fifth-grade teachers.